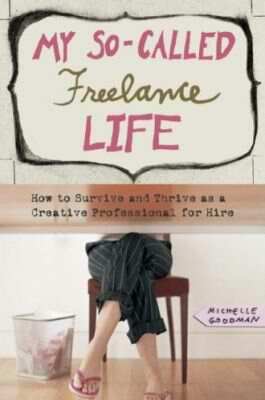 My So-Called Freelance Life is written by full-time freelancer Michelle Goodman. With over fifteen years of experience under her belt at the time this book was published, Goodman provides tips, tricks and advice on how to set yourself up for success in the world of freelance. My So-Called Freelance Life is divided up into three main sections: Section One explains how to adjust to a work-from-home lifestyle after being caught up in the 9-to-5 rat-race for your entire working life. Section Two explains how to market yourself effectively using social networking skills both online and in person, while Section Three teaches how to manage your career once you're up and running and your freelance business is thriving. Within each main section are sub-sections that detail various subjects; including setting up an efficient home office, establishing your rates, building clientele, and even managing your taxes. As with most how-to business books, My So-Called Freelance Life will be useful to those readers just starting out on their own; whereas most of the book's content is common-sense knowledge. The book adequately dissects the procedures of setting up any sole-proprietor business, freelance or not. The upsides to reading My So-Called Freelance Life include Goodman's large sub-section and reminder on taking your taxes seriously, as well as her tips on weeding out legit and not-so-legit freelance gigs. The downsides to the book, however, include the time-sensitive material regarding social networking best practices and website links which are now three years outdated. After all, since it's now 2011, much has changed in the freelancing world since the book was written in 2008. Michelle Goodman has also written The Anti 9 to 5 Guide: Practical Career Advice for Women Who Think Outside the Cube (2007).